A rich and plush complement to any bedding ensemble, this all-season comforter features a unique feather-blend fill that provides just the right balance of warmth and breathability. A crisp white color adds versatile charm, while end to end box-stitching keeps fill in place and ensures a resilience and warmth for years to come. Down and feather-filled products are packed tightly during shipping. Upon receipt, remove them from their packaging, fluff gently, and allow several hours to recover their full loft. In addition, being sealed in plastic packaging sometimes causes the scent of these natural products to concentrate to a disagreeable level. A few hours of airing usually removes the odor. We recommend that this comforter is fluffed at least once a week to maintain down distribution. If you are looking for a LIGHT duvet, and want the option to add a nice blanket- this is the perfect all season solution. Alone it may not be enough, but in a duvet cover or with sheets (and possibly a nice cotton blanket) it is fine for our climate. Decent construction, nice balance of filling and well stitched- this came in way under most feather/down duvets and keeps you as warm if not warmer than a traditional down duvet. I have told others to get this if they are looking for a solid layering piece. Read all the reviews for this feather blend comforter and they were all right on. 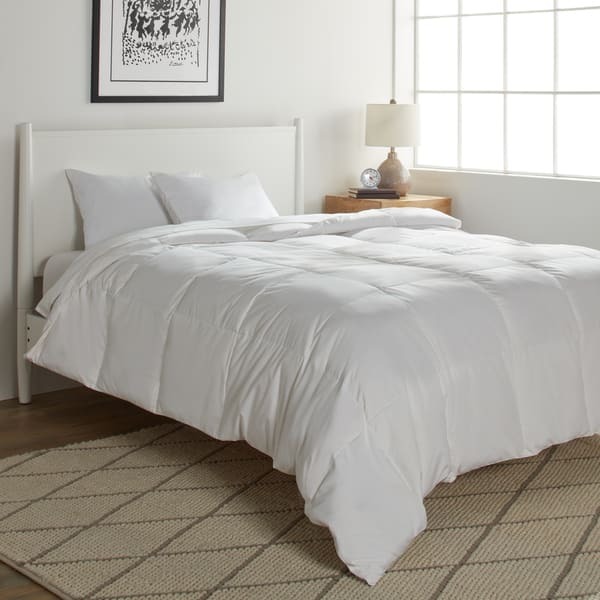 This is a fabulous lightweight feather blend comforter and at a super price! It is exactly what I was looking for. It is super soft, can be fluffed up adequately so that when inserted into a duvet comforter, you can tell it's down, it has no odor and is PERFECT for our climate in S. FL. When it gets a little chilly during some winter months, I can add my lightweight silk coverlet. Notice I stress lightweight because heavy coverings weighing on my legs and feet cause me to ache in the morning. If you can relate, this is an ideal choice for you. I especially love the fact that each block containing the feather blend is totally sewn through all around the square- no filling migrating to other squares or down to the bottom over a period of time. I've had that and what a pain. There is no crinkling sound as with some others, no feathers poking through, and the micro-fiber covering is very lightweight and soft. I do recommend using this to fill a duvet, but it certainly can be used on its own. You will be able to see the filling if you hold the comforter up to the light - so what? You read the reviews, take all info into account, and decide if this meets your needs or not. If you want something thick and lofty, this is not for you. This is why I really appreciate all the honest reviews so I don't waste my time and money ordering an item that is not what I expect. Very happy I found the right feather blend for me. I comparison-shopped and found that Overstock had the best deal for an all-season comforter. A couple of things that affected my decision: I live in FL, so even in "winter," it's not really wintery weather, which means I didn't need a heavy comforter. I knew I'd be using a duvet cover, so I didn't splurge on a high-thread count for the comforter itself. With those things in mind, this works great for me. Love weight but too narrow! Love the weight of the comforter and is just right in length but the width is about 8 inches short to fill a king duvet. So one side of bed is short on filling. Sad because I do love comforter. Okay, so the comforter is everything you want an all season down comforter to be: fluffy, perfectly white, smooth to the touch, easy to fluff, evenly stuffed. BUT I think the fill must be treated with ozone to sterilize it. The comforter smells like ozone and, try as i might (and believe me, I am resourceful) I cannot completely get rid of the smell, although it has gotten less intense over time (I've had it for a little over a month. I am sensitive to odors and ozone is rather noxious so I couldn't conscientiously recommend to a friend. However, I have bought this product before in the past and was in love with it. The first one didn't have a smell or anything. The only thing that made me get rid of the other one was that a college roommate's dog had diarrhea on it. This comforter is soft, lightweight and very warm.It fluffed up quickly after taking it out of the package. It did not have any offensive odor like some feather products can have. I am very pleased with this product. Yes, I would recommend to a friend. heavy duty on those cold nights, feathers start to fall out after your first wash, you have to put a duvet on it or else be prepared to sweap feathers from your floor everyday. I'm not sure what all the negative reviews are about...this comforter came out of the packaging with absolutely no smell, and no feathers came out either. It fluffs up on it's own, and it does say to dry clean only. The down blend filling is very soft, and I have never had issues with it being 'too loud.' Overall, it's a great comforter at a great price. Was somewhat concerned when the package arrived according to lower reviews. Opened up the comforter and let it fluff a few hours. It's NOT what you think of when you're thinking of a huge, fluffy down comforter. But, it is all feather blend and all season, so it's warm. Not as heavy as my old down comforter, but it's sleeker and will probably not end up being as lumpy and uneven as my old one. For $49, you can't lose! I stuck it into my duvet cover and climbed right into bed. Could have been just a bit thicker, just to give the appearance of more comfy. However, it is just what we needed. My husband gets too hot, and I get too cold. This works well for both of us. I was expecting a lightweight microfiber comforter, and this one WAS lightweight. However this comforter had a strong chemical odor that was not noticable right away; the odor intensified the longer you had it covering you. The chemical smell was suffocating and unbearable after an hour of lying under it. I held it up to the light, and could see a scattering of dark brown feathers (no down, which is white and soft). I don't know what was in this thing, but I returned it immediately. I think it is dangerous to your health! This was dubbed a feather sheet by my husband. After only a month's use, it is off the bed and replaced with another quilt. Our dog seems to like it, folded in fours for his bed. All the feathers fell to the sides and we were left with the fabric over us, thus feeling more like a sheet than a comforter. I've had this happen in the past with feather quilts, but after a much longer period of time when one would expect wear. This quilt was no longer useable after only four weeks! Perfect year round comforter. Lays nice on the bed in duvet cover. Not too bulky. I tend to get too hot with any comforter and that does not happen with this one! I put this comforter in my duvet cover that I bought from you recently and it fits perfectly.. With my flannel sheets and the comforter the bed gets warm very fast. I have packed away my blanket. Nighty-night ! Not sure why but my comforter has yet to completely expand. After fluffing every other day or so some of the boxes are filled and the others are completely flat. It looks awful and not presentable. The instructions stated it would take 48 hours to do so, but it has been almost a month. It is noisy as I'd read in other reviews prior to purchasing. Guess I should've followed my first instinct and not purchased it at all. It's ok I knew it was not going to be great quality because of the prize and I did not want to spend so much on it since I bought it for a guest bedroom. It does make a lot of noise. I highly recommend the these comforters. I bought 2 of them and found them to be very soft and very easy to wash. They have lasted well over time and look great on our twin beds. This duvet is a nice weight for the mild temps I live in. I would give it 5 stars but the king size is not a true king and really too small for my duvet cover. I am using it anyway by stuffing the not full end down inside our footboard. Wouldn’t work if I didn’t have a footboard on our bed. I have been very happy with this comforter. Its perfect for the mostly moderate temperatures in Northern California. I have washed it and dried it with 2 dryer balls and all is good! "How do you clean this comforter"
The way to wash the comforter is dry clean. "What is the dimensions of the twin size? Connie"
"How much fill power does this comforter have?" The fill power is approximately 200. "What is the fabric content of microfiber, is it 100% Polyester, or a Cotton/Poly blend? Can you elaborate on the "down fiber" on exactly what that means, is it the little feather parts ripped off of the quick/shaft? Thanks!" It is filled with 60 percent feather fiber, 25 percent down fiber and 15 percent feather for softness and insulation. "Where was this made and where does the fill come from? Thanks"
Hello theis1, this comforter and fill were made in the United States. Thanks for shopping with us! "doe this comforter have the divided squares as it looks in the picture?" Hello Monica T., yes, the squares are that divided. Thank you for shopping with us! "Will this comforter work well with a duvet cover?" Hello kinziesloan, this amazing comforter will work well with most duvets. Thank you for shopping with us.